For many of us in Liberia with Samaritan’s Purse, our lives have changed in ways we never could have imagined. We’ve gone through literally world-changing experiences, and all of us are trying to find our new normal. 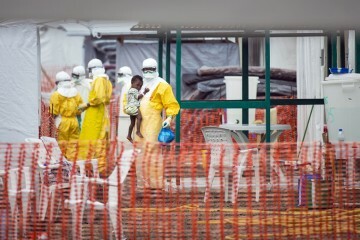 In June, I was training for the Liberia marathon—then Ebola came back in force. Apart from the daily exhausting emotional grind of fighting the virus, there was a new part of our lives that became second nature. No touching. In July, I would come home after working in the Ebola unit and walk straight to the bathroom and shower. My boys would give me “air hugs”—a hugging motion three feet apart from each other. I moved out of our bedroom to the guest room. I was taking no chances. 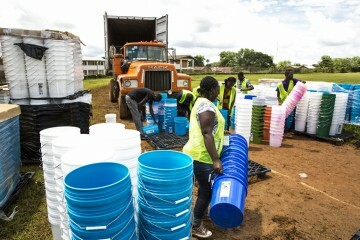 Samaritan’s Purse staff members are distributing supplies to households in Liberia to help people combat Ebola. When we got back to North America, we would give the odd punch in the arm or a pat on the back but no real hugs. I hadn’t kissed my boys’ cheeks for weeks. Twenty-one days after leaving Liberia, I finally was able to give my mom and my boys a big hug and kiss on the cheek. Praise God! And now I’m back in Liberia. I’ve been here since Oct. 12th as the Liberia Ebola response team lead. We’ve ramped up our response and have more than 300 Liberian staff and 17 international staff working hard to stop the spread of the virus. It’s been great to be back, and I see God opening new doors for us to fight Ebola. Being here also means “no touch” is part of my life again. It’s been almost three weeks, and apart from accidentally nudging someone (and then quickly apologizing and dousing myself with hand sanitizer), I have not touched, hugged, shaken someone’s hand, or given a high five. Nothing. So what is it like to live in this “new normal” in a world of no touching? 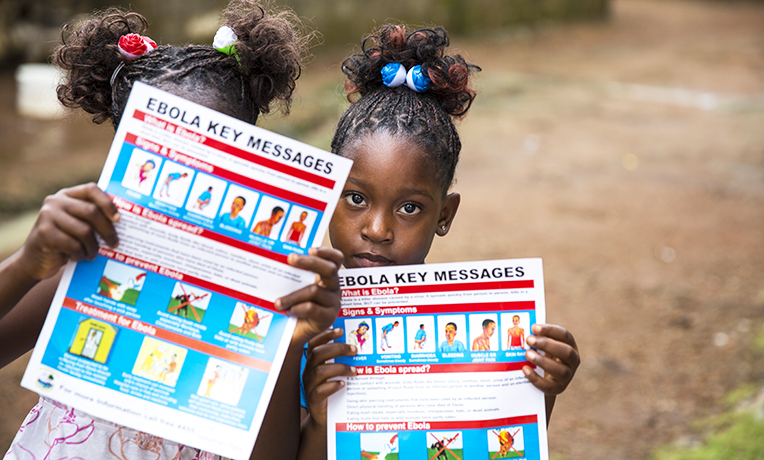 For many of us who have lived in an Ebola-infected area, it has become second nature. You feel isolated even though there are people all around you at an arm’s length away. Your words are more important when you console someone, as you can’t let a hug speak for you. There’s a loss of connection. One of the hardest experiences of the no-touch lifestyle for me came at different times and under two different circumstances. The first was during those dark days back in July when I was already raw with emotional, mental, and physical exhaustion as we grappled with our friends Kent and Nancy being sick. To get to one community, staff members had to load supplies onto a canoe and carry them down the river. Tears flowed like water out of a tap. We couldn’t even look at each other without breaking down. To look at my husband and friends and watch tears run down their cheeks and to not be able to feel the strong arms of them around me added insult to injury. To watch a father not be able to hug his sons as we left broke my heart. However, there is also another side to the no-touch policy. When I returned to Liberia, some of our staff came out to the airport to meet me. My heart was so full of joy! Tears of joy flowed down as we cried three feet away from each other yelling, “We can’t hug, we can’t hug. I am so happy to see you!” All I wanted to do was wrap my arms around Weemor and Dorothy, two of our amazing staff members who are like family to me. But I couldn’t. Not being able to touch in times of sorrow and pain—but also in times of joy—is difficult to describe. It makes everything feel incomplete. Many times since being back here, I have wanted to hug a staff or team member after a long frustrating day or give a big high five when we finally accomplished a seemingly impossible task. But we can’t. In a while, I will go back to North America, and for another 21 days, I won’t touch anyone. It will be a total of almost two months with no physical contact. I wonder how long it will take me to get used to contact again. Or maybe I will just be running around saying, “Hey, HUG ME!” I’m not sure. It’s weird to even think about being allowed to touch again. Staff members working with Ebola patients must wear personal protective equipment. God made us able to physically connect with each other in times of sorrow and joy and fear and pain and to encourage during discouraging times. When that is taken away, it’s like a part of us is lost for a while. Ebola has taken so much away from us, not just touch. But God is still here. I see Him guiding us despite our new normal. He is never changing; His normal is all the attributes that make Him our Lord and Savior. I can feel His “touch” in everything we do. All of us often talk about how we will dance, sing praises to God for His faithfulness, and definitely give hugs of joy when Ebola is over!